In a science fiction crime thriller directed by Peter Hyams, Sean Connery stars as Marshal William O’niel, the head of the police force of a mining operation on Jupiter’s Moon. When mysterious deaths lead the marshal to an illegal drug smuggling ring a war is raged between corporate greed and O’niel’s over active sense of justice. Peter Boyle gives an understated but still menacing performance as the head of the mining operation who is smuggling performance enhancing drugs into the colony to make his work force produce better results. The down side being, any worker taking the drug becomes psychotic and dies within a year of exposure. Connery while still being a commanding presence, brings the pathos of a lawman who is trying to cope with the fact that he is known as a screw-up, that he keeps putting his family through the discomfort of his poor assignments and his moral code which will not allow him to let the bad guys win, no matter what the cost. The films deals with themes of corruption and corporate ideals versus the welfare of the common man and draws harsh and thought provoking parallels to the world we inhabit while still being a solid action yarn. The art direction and set design do evoke its contemporaries such as Alien and Blade Runner but slightly grittier. 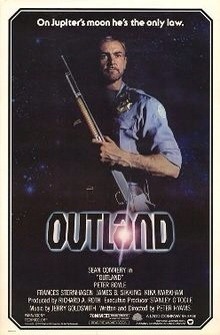 Outland is a movie that is greater than the sum of its parts. Judged by any one aspect alone be it, science fiction, action, mystery or crime movie the film might not hold up as well. However when taken all at once with Sean Connery leading the way it makes for a fun night at home with some popcorn and beer. SIDE NOTE: I picked up my copy of the film at an amazing video store called The Video Underground located at 3203 Washington St, Jamaica Plain, MA 02130.